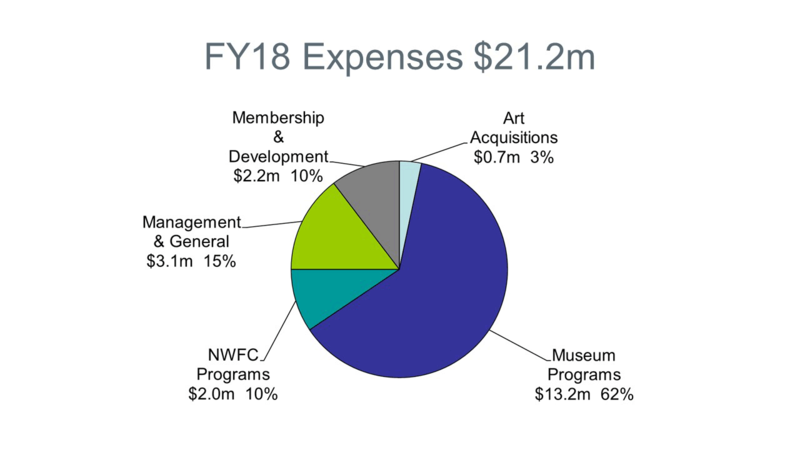 The 2018 fiscal year was exceptional for the Portland Museum and Northwest Film Center. 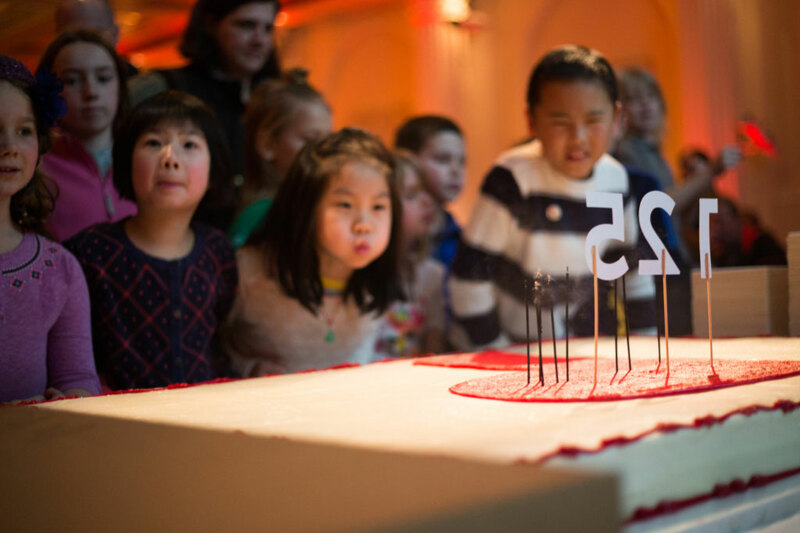 From exhibitions and acquisitions to public programs and partnerships, to near record levels of visitors, the 125th anniversary year reinforced the positive impact that the Museum has in our community. The Museum and Northwest Film Center’s curators, programmers and educators presented 28 exhibitions, nearly 500 films, and hundreds of public programs that represent, reflect, and celebrate the diversity of our community and visitors. These included showcasing the career of architect, preservationist, and collector John Yeon; presenting the creativity and craftsmanship of LAIKA Studios; featuring three generations of Wyeths; examining the complexities of photojournalism through the lens of Fazal Sheikh; introducing visitors to Richard Diebenkorn’s early work; celebrating streamlined car design; and exploring the world through film. Animating Life: The Art, Science, and Wonder of LAIKA was a major achievement, attracting 259,000 visitors. In all, last year nearly 450,000 people visited and participated in Museum and Film Center programs—with one third of those attending for free or at a reduced price, and children 17 and under always visiting for free. The Museum marked its 125th Anniversary last year with a range of programs and exhibitions designed to honor the past, celebrate the present, and look ahead to the next 125 years. These included the exhibitions In the Beginning: Minor White’s Oregon Photographs and Picturing Oregon; programs like Curators in Conversation and Art & Beer: Pitchering Oregon; and events like the Reflecting Forward Gala and the 125th Birthday Party Miller Family Free Day. This past year also marked a significant milestone at the Northwest Film Center. After nearly four decades as director, Bill Foster retired. During his tenure, the Film Center became the region’s premier media arts institution and is now recognized as a national model. A close collaboration with the creative team at LAIKA during Animating Life. Programs with Portland Meet Portland, the Muslim Educational Trust, IRCO, and the South Asian American Arts Festival during Common Ground. In-gallery demonstrations with Native communities, and ceremonial traditions during Interwoven Radiance. Potluck in the Park Christmas dinner service. Literary Arts’ Portland Book Festival. Northwest Film Center collaborations with diverse range of community partners, including Portland Youth Philharmonic, Disabilities Film Festival, Oregon Justice Project, BodyVox, and Women in Film, among others. The Museum’s connection to students, educators, and school districts has continued to expand. For the fourth year, the Museum was proud to highlight the creative work of some 400 student artists and performers during The HeART of Portland, a Portland Public Schools arts showcase held in our ballroom and galleries. This past summer marked the inaugural Teacher Leadership Initiative, which fosters a learning community of K-12 teachers. In addition to providing workshops and professional development for more than 1,000 educators, hundreds of classrooms around the city have requested posters that highlight our collection and providing teaching resources. Through their filmmaking classes, the Northwest Film Center taught more 900 students filmmaking and storytelling skills, including nearly 325 Portland Public School seventh graders as part of the “Maker Experience” program. During past year the Museum acquired nearly 450 works of art, including John Henry Twachtman’s River Village from 1877-78; a notable, 2,000-year-old Japanese jar; 18 Korean ceramics from the John Yeon Collection; a compelling video work by renowned contemporary artist Mickalene Thomas; Sonya Clark’s witty Penny Loafers from 2010; an outstanding wall piece by Marie Watt from 2017; two iconic photographs by celebrated photographer Dorothea Lange; and Rembrandt’s The Raising of Lazarus from 1642. The Library and Collections Information Department achieved a number of milestones, including completing the first phase of the Japanese Print Initiative to digitize our collection. Online collection usage continues to increase each year, and 50 percent of the collection is now online. 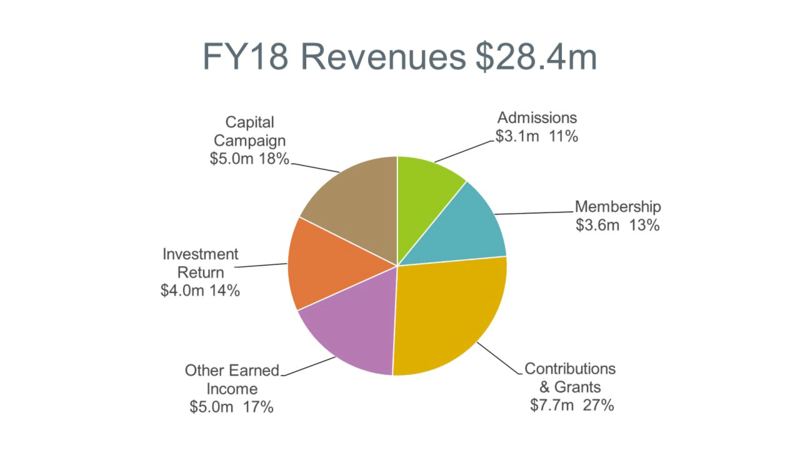 The Museum ended the fiscal year with a balanced budget for the seventh year in a row, and reported a $300,000 surplus thanks to excellent attendance and other earned income revenue. Highlights include a 24% increase in visitation, increase in Store sales and rental income, progress on the expansion campaign fundraising, and an investment return of $4 million. Funding to support the Museum comes from a variety of revenue sources. 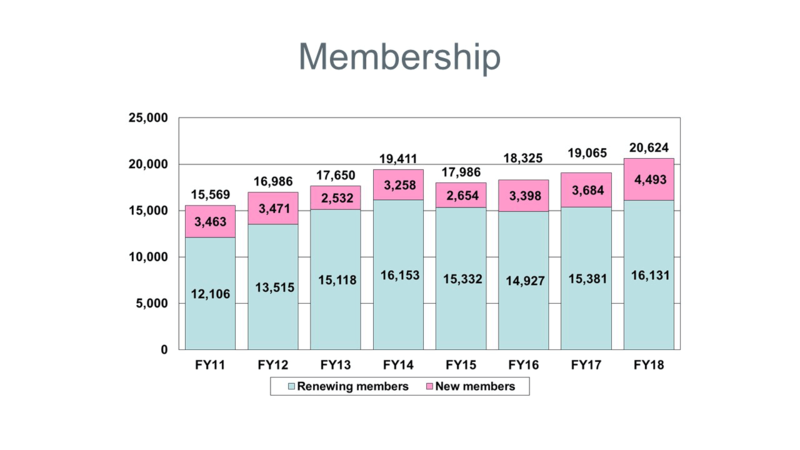 Last year, approximately 24% came from admissions and memberships, 27% from contributions and grants, 17% from Museum Store sales and facility rental fees, and 14% from return on investment. The capital campaign in support of the expansion and renovation project accounted for 18%. The majority of expenses were used in support of Museum and Film Center programs and to acquire and preserve art. 450,000 people visited and participated in Museum and Film Center programs, with nearly one-third of those attending for free or at a reduced price. 60,000 people participated in public programs, including lectures and in-gallery events. 1,043 educators attended professional development events throughout the year. Nearly 1,000 Museum and Film Center docents and volunteers generously donated their time. 1,500 high school students attended free Northwest Film Center Global Classroom screenings, and 1,500 students of all ages attended classes at the Northwest Film Center.